These Pet Rescue level 695 cheats and tips will help you beat level 695 of Pet Rescue. 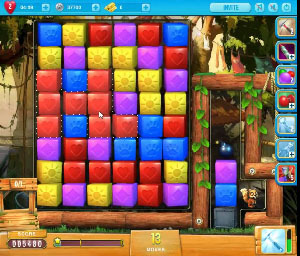 The objective of Pet Rescue level 695 is to rescue 1 pet and score 3,000 points in 25 moves. It’s all about charging that hammer up in Pet Rescue Saga level 695. You need to drop one animal on separate board. Your pet sits on a ledge and can not be dropped till the column to its left is clear. So, use your hammer to break the four blocks the sit there. Here, you won’t get any other boosters. Only the hammer. When you remove all of the blocks in the column, bust out the bomb. Use the bombs to destroy the metal block. Doing so will send your pet to the ground and win you the game. You’ve got 25 moves here. That’s not a lot. Really, your only goal is to charge up your hammer. So, make sure all of your matches are for big points. You can’t settle for match threes or fours here.